A new apparatus at a Burnaby care home is making elderly residents feel like kids again. A new wheelchair swing has been installed in the garden of the Dania Home and the first residents gave it a try on Saturday. The new wooden swing was decorated with flowers and wrapped in festive red ribbon, and when resident Brian Bourke struggled to cut it with oversized scissors he pulled out his Swiss Army knife to finish the job. Then he sat down across from his wife, Joyce Bourke, on the day that happened to be their 67th wedding anniversary. Joyce joked that she didn't want the swing to go too fast, and sat in her wheelchair as Brian used the metal handle to push the couple back and forth. Leslie Torresan, the manager of recreation for the home, said the swing is known as a WhisperGlide and its smooth rocking motion can help reduce anxiety for residents with dementia. She said it also makes a good spot for family members to sit across from grandparents while visiting. "We've had some of the residents say oh I feel like a kid again, I feel free and alive," she said. Wendy Kelly, the Bourkes' daughter, said it's important for people to enjoy movement like they did when they were younger. "It brings back a lot of memories. It's very calming for them," she said. "It's something, I think, they're all really going to enjoy." 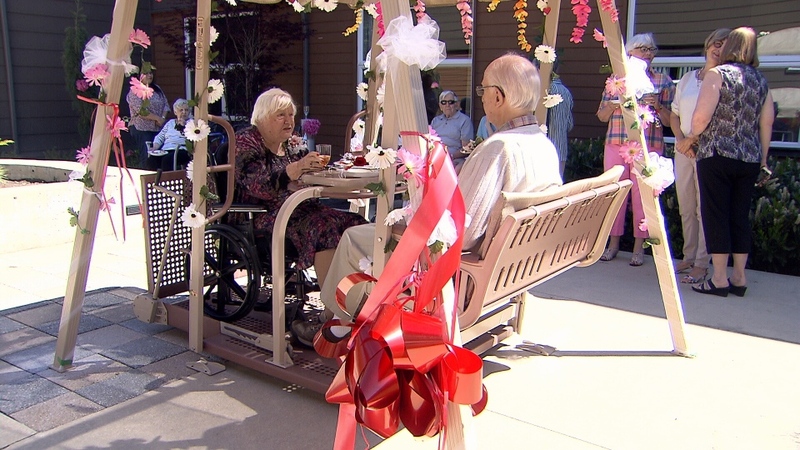 Joyce and Brian Bourke took the first ride on a special wheelchair swing installed at their care home in Burnaby on the day of their 67th wedding anniversary.